Wire Partitions NYC. Stocked in New York City, Complimentary Layouts, Lowest Cost. Lifetime Warranty. Ideal for Security Cages, Perimeter Cages, DEA Cages, Equipment Enclosures. Manufactured with 10ga Woven Wire. Wire Partitions NYC stocks doors in hinged, sliding, double hinged doors and bi – parting slide doors with cylinder locks. Magnetic Locks, Push button Locks, Card swipe or Key fob locks can be included. Wire Partition Cages can be delivered in any width and heights up to 20’H. Tops can be added. Standard heights stocked in Manhattan are 7’H and 8′ high. Standard heights provide the lowest overall costs. Woven Wire Partitions NYC are 10-gauge steel wire, woven into an extremely strong 1-1/2” diamond mesh. Frames, posts, and components are all steel. Panel hardware is accessible only from the inside of partition for added security. Open, woven wire mesh design provides an unobstructed view and allows air circulation and light penetration while providing security. Cost Effective – Durable we offer superior woven wire partitions at an economical price. And we welcome cost and quality comparisons with other manufacturers of wire partitions and security cages. Save money on expensive freight rates. We stock Woven Wire in NYC. Modular Design ‐ the component system makes it easy to design woven wire partitions up to 25-feet in height. Partition doors are pre-hung, cutting installation time in half. Woven wire partitions are easily disassembled and relocated, making reconfiguration faster and less expensive. 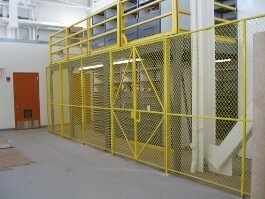 Maintenance-free – our woven wire partitions have a long-lasting, maintenance-free gray powder coating finish. Woven wire partitions are ideal for separating and securing any space in industrial, commercial, Hotels, Pharmaceuticals, Government. Woven wire partitions can be used to enclose work areas, to create secure storage cages in factories and warehouses, and to provide access control and loss prevention. Our woven wire partitions are perfect for stock rooms, DEA Cages, Tenant Storage and commercial storage facilities. Welded Wire Partitions provide code compliant Machine Guarding enclosures for electrical equipment and moving machinery. Our Machine Guarding – Safety Fence Specialists provide complimentary layouts daily. Enclose electrical equipment and moving machinery with Machine Guarding – Safety Fence. Stocked in Manhattan Machine Guarding – Safety fence can be delivered and installed in 1 week. Contact us today for a complimentary code compliant layout. LockersUSA is open six days a week. Sales@LockersUSA.com or P(917) 701-5795 . Wire Partitions NYC, Woven Wire Mesh Partitions NYC, Welded Wire Partitions NYC, Wire Partitions New York City. 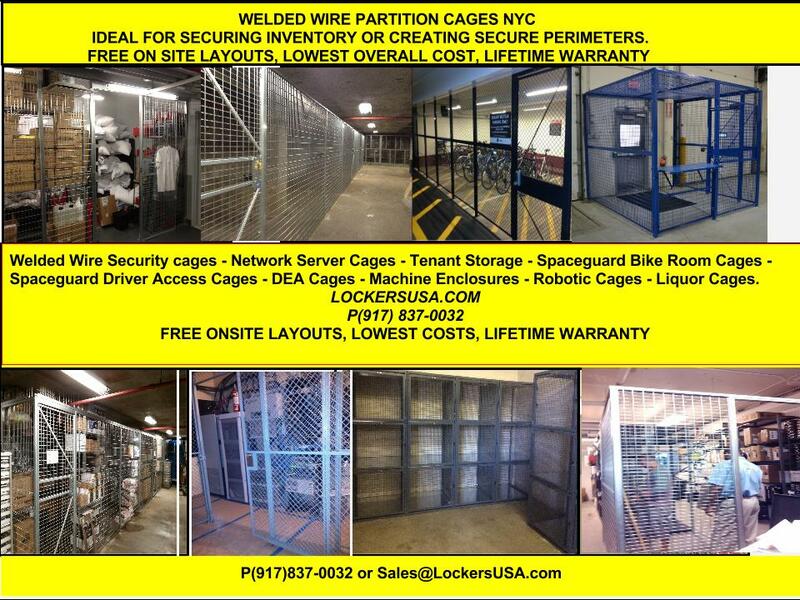 Wire Partitions Brooklyn, Wire Partitions Long Island City, Wire Partitions Queens NY, Wire Partitions Bronx. 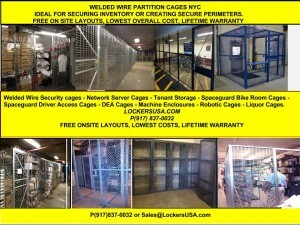 Wire Partitions delivered daily to NYC, Brooklyn, Queens, Bronx, Staten Island, all of New York.